TORONTO , June 7, 2018 /CNW/ - Cobalt Power Group Inc. ("Cobalt Power" or the "Company") (TSX.V: CPO, OTC Pink: CBBWF) is pleased to announce the Company's closing of the recently acquired Ontario Cobalt block (press release Feb 13, 2018 ) which increases Cobalt Power's landholdings by approximately 25% to over 11,680 ha (28,862 acres). This acquisition positions Cobalt Power as one of the largest landowners in the Cobalt and Silver Center camps of Ontario . The Ontario Cobalt Project consists of 14 mineral claims (184 units) covering 2,944 ha (7,275 acres) located in the Cobalt Camp, Ontario . Highly prospective land package along the main structure of the Cobalt Camp. Property exhibits all geological features for Co-Ag mineralization (diabase dyke, Coleman member sediments, major regional faulting). The company is fully funded for 2018. Aggressive exploration program planned for this year. Government geological mapping indicates that the claims are underlain entirely by the rocks of the Cobalt Group, including the Coleman Formation, and the Nipissing diabase sill. In this area, the Coleman formation consists of a sequence of conglomerates, sandstones, siltstones and argillites, which is the typical composition of this formation throughout the Cobalt camp. The Nipissing diabase is generally a sill intruding the Coleman sediments, but locally can include dykes. The Nipissing mafic rocks generally appear to overlie the Coleman formation, but may locally overlie the Coleman. Throughout the Cobalt camp, the most significant Co-Ag mineralization is commonly associated with the Coleman formation where it is intruded by the Nipissing sill, and where quartz-calcite-filled fractures extend into the over- or under-lying Coleman sediments, typically up to 30m above and below the contacts. The Montreal River fault is present towards the eastern margin of the claim block. The general model for Co-Ag mineralization in the Cobalt camp calls for a spatial relationship with periodically reactivated regional fault systems rooted in the Archean basement. Heat released by the Nipissing Diabase intrusive facilitated the mobilization of various metals from the Archean basement, which were then deposited in localized displacements of the Huronian-Archean unconformity, particularly in the Coleman formation, along these reactivated faults. The Montreal River fault is one of the major regional faults in the area. Very little historic work has been reported for this area, but with the presence of both critical stratigraphic units in juxtaposition, as well as the presence of a major regional fault on the property, the geological setting appears to be highly favourable for successful exploration. The purchase will be accomplished by Cobalt Power acquiring all of the issued and outstanding shares in Ontario Cobalt Property Developers Inc. 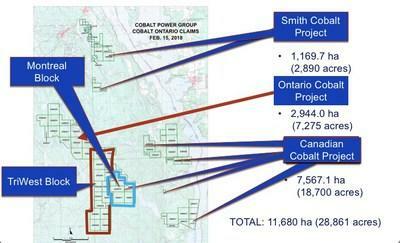 In the exchange for the issuance of common shares of Cobalt Power to the existing shareholders of Ontario Cobalt Property Developers Inc., the latter will be granted a 2.5 % net smelter royalty, of which 1.5% may be purchased by Cobalt Power at any time on or before the seventh anniversary of the closing date in consideration of a $1,000,000 cash payment This is an arm's length transaction and the transaction will not create any new insiders of the Company.